When Dave Matthews and Sean McKenzie first met, they realized they had a few things in common, like a passion for making wine at least as strong as their passion for drinking it. They set out into wine country, looking for a way to make quality wines accessible to everyone. Along the way, they found inspiration in the down-to-earth characters and unforgettable flavors that give the region its rare kind of charm. You might know Dave from his day-job as a professional musician, but his passion for winemaking stretches back nearly as far as his love for music. With a winery in Virginia under his belt, Dave's no amateur, but when he chose to lay down roots in the California wine country, he knew he couldn't go it alone. New Zealand native Sean McKenzie has spent a lifetime perfecting his craft at wineries around the world. At The Dreaming Tree, Sean repeatedly demonstrates his ability to preserve California's most prestigious growing regions and their respective styles through the portfolio's stellar lineup. When you get two people together who share the same passion, interesting things are bound to happen. 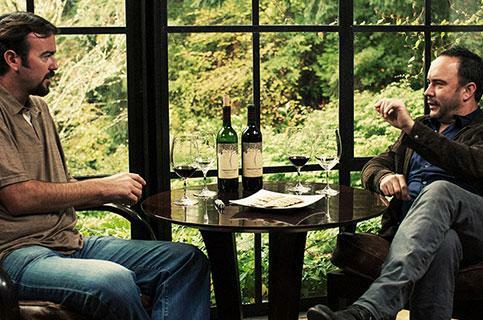 Whether it's finding the right notes and rhythms in a piece of music, or the right tones and flavors in a great bottle of wine, Sean and Dave know how to create something special that not only entertains, but really hits the spot. Like the saying goes - "Great minds drink alike".